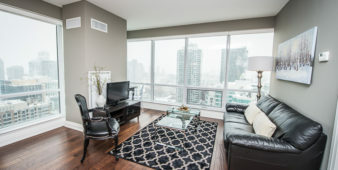 This gorgeous 1-bedroom Toronto short-term rental is an inviting and modernly finished living space. 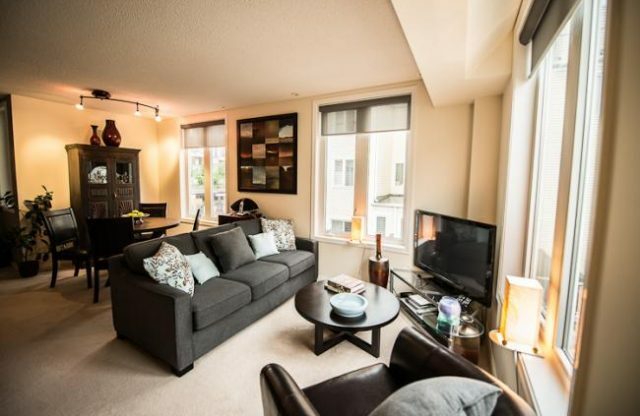 It is the idyllic place to call home for your extended stay in Canada’s most popular city. The kitchen is a bright and inviting space. It is superbly decorated with light wood cabinetry, stainless steel appliances and a beautiful countertop. 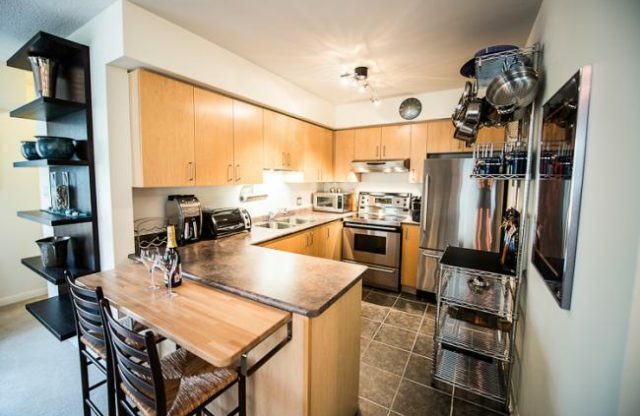 This u-shaped space is perfect for all your cooking and baking needs. It is complete with a wood-top breakfast bar accompanied by two high-top chairs. Guests do not need to worry about bringing cooking utensils as Sky View Suites is happy to provide all cook ware. The living room faces an expansive set of large windows. This bathes the room in warm, natural light, while also providing an impressive view. 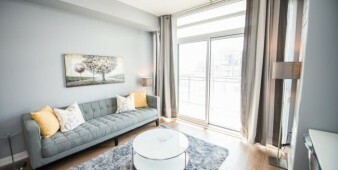 The area features a grey linen couch, leather bucket chair, and flat screen TV. It is a great space to kick off your shoes after a long day in the bustling city. The bedroom is a welcoming space to relax after a day of work or exploring the Toronto scenery. The furnished living space upholds a queen sized bed, chestnut brown furnishings, and a spacious closet. All the linens required for this room are provided by Sky View Suites. The den of this unit, is a secluded space perfect for getting work done or simply browsing the web at a comfortable desk. 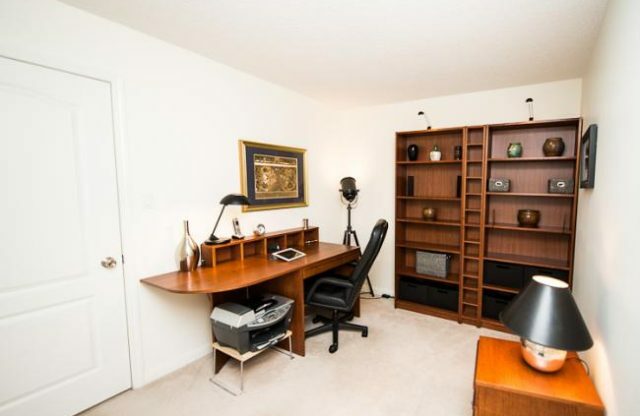 Complete with printer and desk lamp, this acts as the perfect home office. Another great feature of this suite is the large balcony that guests have access to. 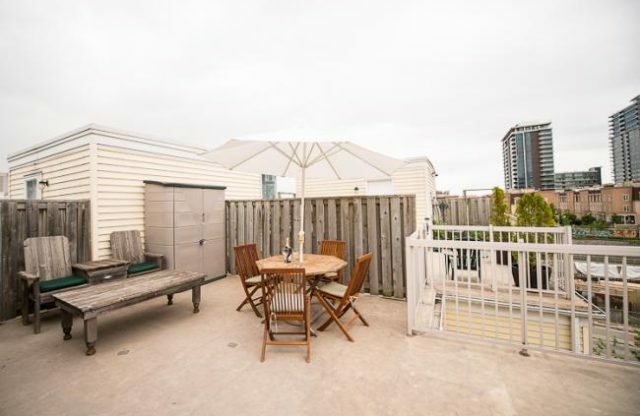 This open space is perfect place to host a dinner party in the summer or simply relax and enjoy a good book on. 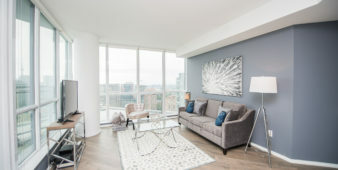 Guests who are intrigued by the Liberty Village suite might also be interested in other 1-bedroom suites that Sky View offers. 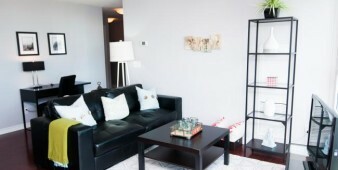 This beautifully maintained 1-bedroom suite is situated in an equally beautiful area of Toronto. It is only a few minutes from the lakeshore and waterfront. This area is rich in scenery, walking paths, and fresh air. The Ricoh Coliseum an iconic venue used for ice hockey, agricultural displays and various shows. 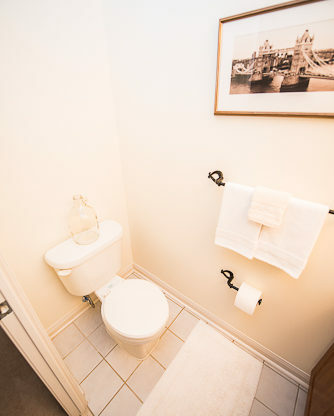 As a guest of this furnished suite, you will find yourself right across the street from Massey Harris Park. An expansive lush green space where you can go to recharge your city laden body. Edulis restaurant is located a short distance away. This cozy, upscale restaurant serves a seasonal menu of wild and foraged foods used to elevate Canadian dishes. Try some true Canadian cuisine at this local hotspot. It carries a 4.2-star rating. 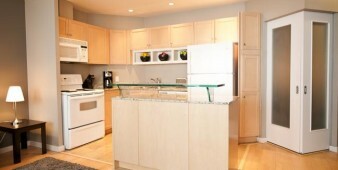 This furnished suite is also close to various retail stores, cafes, and pharmacies. Five minutes in any direction will take you to a whole new world. If you’re in the mood for some sports take yourself over to the newly established BMO field which houses a variety of professional sports including Toronto’s own football and soccer teams. Medieval Times Dinner & Tournament is located just a few minutes away. This iconic venue performs jousting, horsemanship, and falconry, with a 4-course, utensil-free meal, served in a castle like space. This is a fantastic opportunity for guests to take themselves back hundreds of years and experience a truly entertaining show. The Queen Elizabeth theatre is another venue that is located just down the road from your Toronto short term rental. This is Toronto’s newest live music concert hall. Journey down to this brand new building and be entertained by the greats. The Molson Canadian Amphitheatre is just a short distance away and this legendary outdoor theatre is a lakeside concert space for touring shows, with reserved seating and a general admission lawn area. It is a great place to let loose and have a good time. 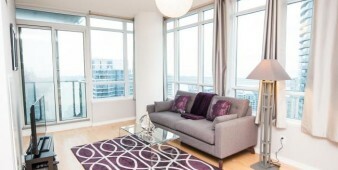 The building which houses this incredible furnished suite offers more than meets the eye. When you rent a furnished apartment through Sky View you are awarded all of the luxurious amenities that Sky View has to offer. 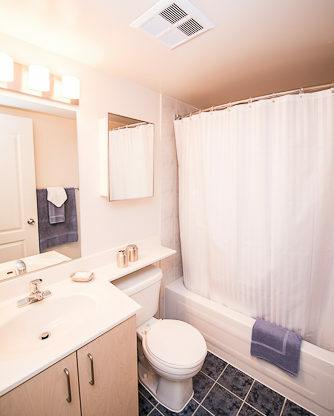 The amenities include; wireless internet, cable TV, a fully equipped kitchen, ensuite washer dryer, a bi-weekly cleaning service, and parking. All of these services are provided to Sky View’s guests at no additional cost. 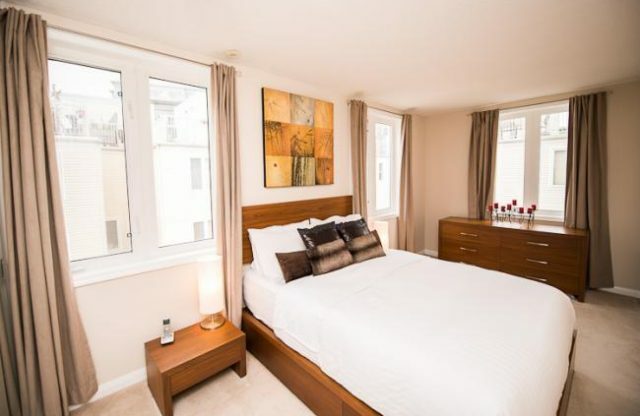 This makes Sky View’s furnished rentals a viable and cost effective alternative to traditional hotel room rentals.